Coda Effects - What is guitar signal? Coda Effects Theory What is guitar signal? We hear about it all the time: it should not be degraded, you have to respect it, we can boost it, clip it or digitalize it... What are we talking about? Electric guitar signal of course! 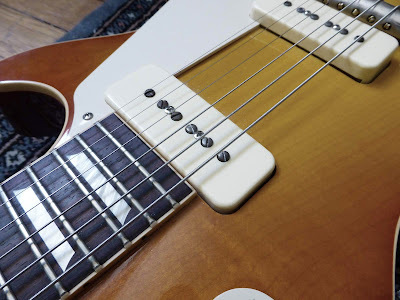 As you may know, the vibration of the strings is converted in an electric signal by your pickups, to restitute guitar sound under an electric form. How does it work? How can an electric signal encode pitches or volume? How can it be modified by guitar pedals? Where it all began: your guitar pickups! What is electric guitar signal? As you know, there are 2 types of currents: direct current (DC) and alternate current (AC). Direct current has a fixed value (for example, the +9V that you get from a battery), whereas alternative current oscillate between a positive and a negative value, at a given frequency. For instance, the current oscillate with a 50 Hertz (Hz) frequency on a classic house electrical outlet. Your electric guitar signal is alternate current! The vibration of the string is captured by your guitar pickups coils, which generate an alternate current. The values between it oscillates depends on many parameters, especially your pickups output. The more the output level of your pickups is important, the bigger the amplitude of your initial signal will be. How is volume defined by a voltage? The signal amplitude (difference between the maximal and minimal voltage value) is directly linked to the volume. The greater the amplitude, the greater the volume! (and vice versa) It is as simple as that. Most boost pedals just transform a low volume signal into a high volume one, by amplifying the signal. We can understand the origin of the word "amplifier"! It just amplifies the initial signal loud enough so that it can be heard through a speaker. It is also what happens when you strum the strings in a stronger way: the strings vibrate more and the amplitude of the signal is larger. 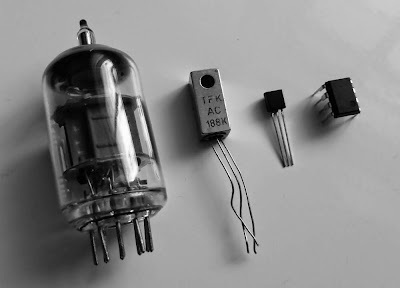 Historically, amplification could be done only with tubes in the beginning (that you can find in old amplifiers or radios). When transistor was invented, it was then possible to create stompboxes capable of amplifying signal! A common collector circuit is a classic layout that you will find in many circuit, for instance in the big muff circuit. Today, with integrated circuits, it exists smaller op-amps that can amplify the signal with one simple chip! Some of these chips / recent transistors even use almost the same technology as tubes to amplify an audio signal (FET/MOSFET burr brown for example). To reduce the signal amplitude (and thus the volume), a simple resistor is enough! That is why there is generally a potentiometer wired as a variable resistor at the end of a circuit to set the output volume. You can find this in many many circuits, like in the Jan Ray. How alternate current can define a note or pitch? As we have seen above, alternate current is characterized by a period, which defines a frequency (frequency = 1/period), written in Hertz (Hz). For example, alternate current in an electrical outlet has a frequency of 50 Hz. Each note has also a frequency! For instance, you may have heard of the 440 A that is the standard pitch used as a reference for many instruments. It is named like this because of its 440 Hertz frequency! The higher the frequency of oscillation of the current, the higher the pitch is. Thus, each note is defined by its frequency. By modifying the frequencies, the sound can be modified. The characteristic sound of a wah wah is due to the fact that it will only let some frequencies go through it. The "ducky" sound that you get in the middle position of a wah is due to the fact that it lets pass only mediums frequencies. Tone potentiometers also affect frequencies by eliminating high frequencies (diminishing trebles) or low frequencies (less bass). Of course, it is a bit more complicated than that. When you play a note, there are many frequencies that are played at the same time, and not only one (harmonics for instance). When you play chords too! When several frequencies are played at the same time, voltages are simply added. What are effects doing to your signal? Lets see a few examples of how effects modify your electric guitar signal. You can see here that the original signal has a lot of variations of volume: there is a lot of dynamic. However, when a compressor is used, signals are closer to each other: a bit of dynamic is lost. A compressed guitar signal actually sounds very good, that is why many guitarists use a compressor, with a price to pay: you loose a bit of dynamic. Saturation happens when the top and bottom of the signal are clipped. This can be done with different ways: saturation of tubes, transistors, using diodes that will let some voltage go to the ground...etc. We can clearly see here that the top of the signal curve has been cut: the signal was clipped. To better understand what happen here, read my article about the Vemuram Jan Ray circuit. Diode clipping is explained in it. We can also see that the more the signal is saturated, the more it is compressed! This is something you can clearly hear when you use too much saturation for your guitar, or for instance with a big muff. The biggest difference between a numeric and an analogue signal is that an analogue signal can have an infinity of values between 0 and 1, whereas numeric signal is limited because of its binary nature (only 1 and 0...). An analogue signal with an infinite value of 3.3333333...etc. can exist, however a digital signal will stop at some point depending on the quality of it. This quality of the digital signal is generally expressed in bits / kbits per second. A mp3 has a quality between 64 and 256 kbits per second. A CD is 1411 kbits/sec. So you have a fixed number of points / seconds. The possible values of these points depend on the encoding quality. 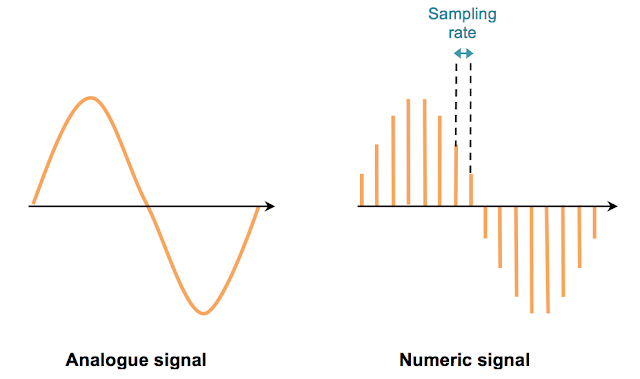 The sampling rate also defines the numeric signal quality. The higher it is, the most precise your numeric signal will be (and will not generate noise). Thus, we can understand why people did not really liked numeric effects at some point. The "coldness" of the sound that you can feel with a numeric pedal comes from this encoding process. However, today, technology have evolved so much that encoding can be done without an audible quality loss. Here it is, I hope this article has enlightened you a bit about this mysterious "signal"... If you liked this article, thank me by liking the Coda Effects Facebook page! Any questions? Post a comment! A bit of theory about compression, clipping...etc.